What does Commandaria taste like? The traditional wine of Cyprus is explored in this video. 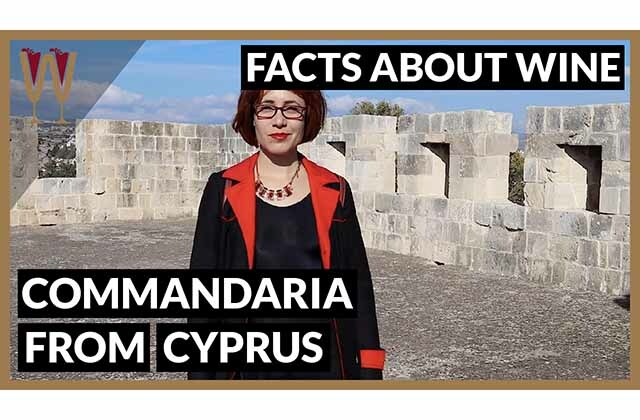 Today WineScribble visits Kolossi Castle in Limassol, Cyprus and shares her five facts about Commandaria wine. Find out more about the oldest appellation named wine in history, including the scandals of the middle ages. Enjoy the presentation! Good wine tasting is like good conversation. If you want to enjoy yourself choose someone with a past. And, the wine with the richest, most scandal filled history is undoubtedly Commandaria from Cyprus. Here are my fast five wine facts. What does Commandaria taste like? Commandaria is the oldest appellation named wine in the world that is still produced today. It goes back all the way to 800 BC. A similar wine method is described by the ancient poet Hesiod. Later it became known as the Cypriot ‘Mana’. A possible interpretation for this name is that it’s derived from the word mana, which is Greek for mother. It was vinified in large clay pots and, when these were emptied, a little bit of wine was always left at the bottom of the clay pot. When new wine was added to the pot, the remnant of the previous wine contributed to the vinification. So that the old wine became the mother of the new wine that was being born. So, you know what that means don’t you? When you bring a glass of Commandaria to your lips now, a tiny tiny part of it might be the same wine enjoyed by Homer, Hesiod, Cleopatra and Richard the Lionheart! In its current name and form Commandaria goes all the way back to the 12th century, when the Knights Templar and the Knights Hospitaller made it very popular. The knights established their headquarters at Kolossi in Limassol, where they built their castle. The castle and the surrounding lands attached to it were known as La Grand Commandarie. And the knights renamed this local wine to Commandaria so they could sell it more easily to European aristocracy and clergy. This product relaunch may be the first example of rebranding and viral marketing. But, it certainly ensured the continued popularity and survival of this ancient wine. So, this is why many of the traditional Commandaria wines pay tribute to these Knights. For example, Commandaria Saint John by KEO pays tribute to the Order of Saint John of the Knights Hospitaller. Whereas Commandaria St. Nicholas by ETKO commemorates the beautiful church dedicated to St. Nicholas built by the Knights Templar in Nicosia. Commandaria is made to strict specifications. And this ancient wine is made of two grapes indigenous to Cyprus. The white variety Xynisteri and the red variety Mavro. And, the colour of the wine can vary depending on what proportions of these two grapes are used by the winemaker. Also, the ratio isn’t fixed, so light amber means more Xynisteri being used whereas a dark mahogany hue means that more Mavro is used. Grapes are dried in the sun for up to two weeks before vinification to concentrate the flavour and raise the sugar levels. Commandaria can only be made in the fourteen Commandaria villages situated in the foothills of Troodos in Limassol. The grapes must be grown, dried and vinified within these 14 villages. Commandaria wine was the darling of European aristocracy in the Middle Ages. In 1191 it was served on King Richard Lionheart’s wedding to Berengaria of Navarre, and upon tasting it, Richard the King of England and Lord of Cyprus pronounced Commandaria wine to be ‘the wine of kings and the king of wines’. Also, in the 13th century the French King Philip Augustus organised the first official wine tasting event. This came to be known as the Battle of the Wines. More than 70 samples of wine were brought from many famous European wine regions to compete with one another. The judge was an English priest who divided the wines into two categories ‘celebrated’ and ‘excommunicated’. In the end the only wine left standing was Commandaria, and the judge priest awarded Commandaria wine the honorary title of ‘apostle’. And, I’m not making this up. This was ‘hot or not’ for wine in the 13th century. Also, in the 14th century Pierre de Lusignan met up with the kings of England, Scotland, Denmark and France. And, the event was hosted by the Worshipful Company of Vintners, in their hall in London. It came to be known as the Banquet of the Five Kings. The only wine deemed worthy to be served at such a grand occasion was Commandaria. Moreover, at this banquet Pierre de Lusignan was hoping to convince the other European rulers to join forces with him for yet another crusade against the Middle East. Upon tasting the wine and thinking matters through the other rulers decided against this. Thank you Commandaria! So what does Commandaria taste like? The colour ranges from the light amber of caramel to the opaqueness of dark molasses or treacle. The ageing in barrels rewards the nose with aromas of walnut and wood. However, at 200 grams of residual sugar per litre, you’re right to expect sweetness, but it’s never cloying. And there’s enough acidity to balance it out. Dried fruit such as prunes, apricots and figs are present, but there are also plenty of citrus notes such as orange marmalade and candied orange peel. And, this is a rich and concentrated wine, with a luxurious mouthfeel and a long finish. Furthermore, if you decide to try Commandaria remember it is a wine with a long history behind it and your tasting of this wine is another thread to the rich tapestry that makes up the history of the Commandaria taste. Tasters comment below and let me know if you’ve enjoyed these fast 5 facts about Commandaria. So, hit that thumbs up button and use the share button to share this with a friend. Cheers everybody! Also, have you subscribed yet? Go on, I know you want to.